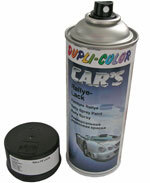 Tow componet spray paint for small repair and car painting of Trabant. The secound componet (harder) is filled up at an separate part of the spray tin. You can activate it when you need the colour. Fleece to buff surfaces form coatings and cleaning of aluminium, brass ec. Can be used for working by hand. Colour spray best use for old and Youngtimers. For coating axle parts, seatframes, wheeles, engines etc. Tin contens: 400ml RALLYE SCHWARZ MATT. Small plug for holes diameter 5mm. Can be used for the car body.